Remember ROYGBIV? I do. The mnemonic is how I learned the seven colors of a rainbow—red, orange, yellow, green, blue, indigo and violet. Nowadays I use the acronym to represent the colors of food I should be eating. Because nature highlights the beneficial nutrients in fruits and vegetables by giving them bright colors, eating by color is an easy way to load up on nature’s superfoods. 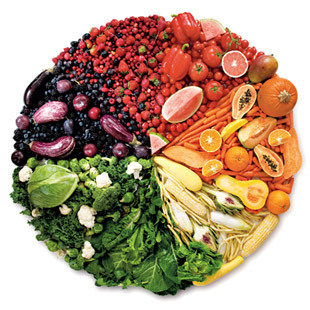 Each color represents phytochemicals—compounds that benefit our health in different ways—which is why you should eat a colorful variety of vegetables. For example, anthocyanins and proanthocyanins—two antioxidants associated with keeping the heart healthy and the brain functioning optimally—make foods like blueberries, eggplant and cranberries blue, purple and deep red. The USDA 2010 Dietary Guidelines for Americans, however, suggest paying particular attention to three colors: dark green, red and orange. What counts as a “cup”? 1 large red bell pepper, 8 large strawberries, 12 baby carrots or 2 medium carrots, a sweet potato or a medium pink grapefruit. Why they’re important: Red foods—such as tomatoes and red peppers—contain lycopene, a phytochemical that may help protect against prostate and breast cancers. Alpha and beta carotene make foods like carrots and sweet potatoes so brilliantly orange. The body converts these compounds into the active form of vitamin A, which helps keep your eyes, bones and immune system healthy. These phytochemicals also operate as antioxidants, sweeping up disease-promoting free radicals. What counts as a “cup”? A cup of cooked greens, 2 cups raw greens or 10 broccoli florets. Why they’re important: Dark, leafy greens (spinach, chard and arugula) are good sources of lutein and zeaxanthin, phytochemicals that accumulate in the eyes and help prevent age-related macular degeneration, a leading cause of blindness in older people. They’re also rich in beta carotene. Dark green cruciferous vegetables, such as kale and broccoli, provide compounds called indoles and isothiocyanates, which may help prevent cancer by amping up the production of enzymes that clear toxins from the body.